Fast-tracked into the senior Elite Player Squad as cover for the injured Mathew Tait, Armitage emerged as one of England's highlights from what was a disappointing autumn series in 2008. Born in Trinidad, he won his first cap against the Pacific Islanders, a performance which earned him the man of the match award and was described by England manager Martin Johnson as one of the best debuts he had ever seen. He subsequently started the next three matches and registered his first international points, a 45-metre drop goal against Australia. He cemented his place in the England line-up throughout 2009 with three tries during the Six Nations and a brace against Argentina later that year. A shoulder injury sidelined him for the autumn internationals but he was back in the mix for the 2010 Six Nations only to lose the No.15 shirt to Ben Foden. Armitage was forced to play a supporting role for the rest of the year but found himself on the sidelines at the start of 2011 after picking up an eight-week ban in the wake of an altercation with an anti-doping official. He was found guilty of pushing and using threatening and/or abusive and obscene language towards the officer following a Premiership appearance for his club London Irish. And he was in trouble again before the end of the season after being found guilty of striking Northampton fly-half Stephen Myler during their Premiership clash at the Madejski Stadium. The subsequent three-week ban he will miss Irish's final league game and also England's match against the Barbarians at Twickenham on May 29. However, Armitage was selected for England's World Cup squad and secured a place on the plane to New Zealand with a strong performance against Wales in England's first warm-up game for the tournament. Once at the World Cup, Armitage profited from Mark Cueto's injury and started against the Pumas before crossing the line in England's second match of the tournament against Georgia. However, he was banned for the quarter-final showdown with France after being found guilty of a dangerous tackle on Scotland's Chris Paterson. On his return to the UK, Armitage's indiscipline woes returned with a five-week ban for a dangerous tackle on Bath's Tom Biggs during their Aviva Premiership clash at the Madejski Stadium. Armitage was also found guilty of striking lock Dave Attwood with a knee during the same match. Armitage was one of the high profile casualties of the 2012 EPS announcement as he was relegated to the Saxons and he was later dropped from that squad following a nightclub incident that led to his arrest. 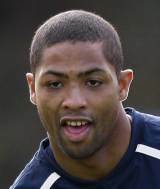 Later that year, he ended a decade-long spell with the Exiles by securing a move to French side Toulon where he would join his brothers Steffon and Guy. He began playing rugby for Richmond before he moved to France, where he played for Racing Rugby Club de Nice and represented France U16s. On his return to England, he joined the London Irish Academy in 2002, going on to play for England U19s and England U21s before being named in the England Sevens squad for the 2004-5 season. Along with his team-mate Topsy Ojo, Armitage established himself as a prominent part of the threatening Exiles backline, and his inclusion in the 2006 England Saxons squad for the Churchill Cup saw the talented speedster take the step up to the next level.